Stage Movement Workshop: Physical Techniques for Telling the Story with Alice Nelson, April 24! They say that a picture is worth a thousand words… What’s your picture saying? For Actors & Directors! Maximize the story that your body can tell by maximizing your control, connection and understanding of “physical stories”. Stage Movement classes give actors the ability to make holistic character choices, give the director options, and gain control over physical habits that detract from your performance. Directors can get a better understanding of how to balance the stage, use space for status, and use blocking correctly. Alice Nelson is a Calgary-based Actor, Playwright, Director, Theatre Educator, Producer, Puppeteer, Improvisor, Mask Maker and Clown. She holds an MFA in Ensemble Based Physical Theatre from Dell’Arte Physical Theatre School in California. Alice has taught at Mount Royal University, Red Deer College, Rosebud School of the Arts, Artstrek Theatre Program and Arts Commons. She has worked with various Alberta theatres. She has written and toured solo shows and co-created productions regarding social and political issues. Her company, Underdog Theatre, is currently in development on a satirical modernization of Orwell’s Animal Farm. As well, she is a volunteer clown and advocate with the international humanitarian organization, Clowns Without Borders. Her passion is supporting and raising awareness of CWB’s amazing work! Sage Theatre has a special discount for Friends of Morpheus Theatre! Meet the man who created the Fantastic Four, the Avengers, Captain America, and more… and find out why no one knows his name. Jack Kirby pours his quintessentially Twentieth Century life into his comics, only to make the fateful mistake that sends him into obscurity while his creations become known to every person on Earth. Get inside the history of the man behind so many of your favourite characters, and discover that Jack was just as colourful, and as complicated, as any of his superheroes. Robert Klein stars as artist Jack Kirby, having done amazing work at Theatre Calgary in King Lear and A Christmas Carol and in the title role of the Shakespeare Company’s production of Titus Andronicus. David LeReany stars as Stan Lee, the Marvel spokesman. David has worked throughout Calgary and Alberta, notably on the locally-filmed acclaimed show Fargo. They join Cheryl Hutton herself acclaimed for her recent work in Lunchbox Theatre’s Book Club, Cam Ascroft (from Vertigo Theatre’s The Mousetrap) and Justin Michael Carriere, who recently performed in the acclaimed Fight or Flight with Verb Theatre. 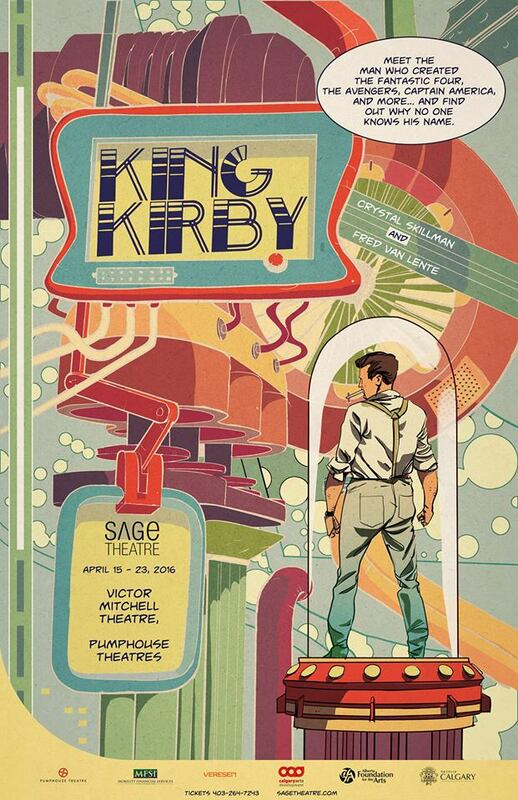 King Kirby asks the question: What happens when an artist doesn’t own his own legacy? Can he ever get it back?